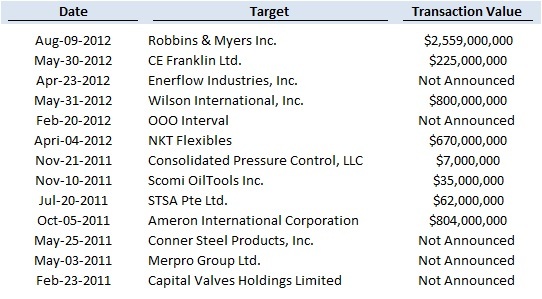 The recent announcement that Robbins & Myers (“R&M”) is being acquired by National Oilwell Varco (“NOV”) for $2.5 billion is indicative of the continuing strong level of M&A activity in the Flow Control industry. While overall M&A activity has not rebounded from pre-recession levels, the Flow Control industry (the manufacture or distribution of products and/or services which measure, manage or control the flow of liquids and gases) continues to have many active strategic acquirers like NOV and strong interest from financial sponsors looking to build out an investment in the industry. Not surprisingly, Flow Control market valuation multiples are also generally outperforming the broader market. R&M is a leading supplier of engineered equipment and systems in energy, industrial, chemical and pharmaceutical markets. With a heavy focus in oil and gas, R&M is organized around energy services and process/flow control manufacturing. Core products include down-hole pumps/systems, power sections, pipeline closures, wellhead products, tubing wear products, well control solutions, glass-lined reactor systems, thermal fluid systems, grinders and mixing equipment. R&M generated $1,019 million in revenues for the 12 months ending May 31st with 3,400 employees in 15 countries. NOV is also a provider of oilfield products and services. With almost $16 billion in annual revenue, Houston-based NOV has an employee base of 50,000 operating in over 1,000 locations worldwide. The company is a leader in providing major mechanical components for land and offshore drilling rigs, complete land drilling and well servicing rigs, tubular inspection and internal tubular coatings, drill string equipment, extensive lifting and handling equipment and a broad offering of down hole drilling motors, bits and tools. The combination is a logical assimilation of core products – especially the addition to NOV of R&M’s downhole tools, pumps and valves into NOV’s petroleum and transmission segments. The combined manufacturing infrastructure and portfolios of technology strengthen NOV’s already strong presence in the oil and gas market. This transaction allows R&M to join forces with an industry leader that will enable its business segments to capitalize on their respective strategies, enhance leadership positions in niche applications, and execute growth plans at a faster pace. The announcement of the R&M acquisition is NOV’s latest deal in the oil sector, as the company continues to seek to take advantage of a boom in drilling for oil and natural gas – especially in hardened rock formations untapped by previous generations. Other key acquisitions include drilling equipment manufacturer CE Franklin, oilfield equipment distributor Wilson International, pipe manufacturer NKT Flexibles and pipeline products company Ameron International. These acquisitions added complementary products and services to NOV’s core product base. The foregoing discussion is illustrative of the meaningful and comprehensive acquisition demand that exists in the Flow Controls sector. Consistent with NOV’s strategy other firms are actively seeking attractive, synergistic acquisitions. Importantly, acquisition size varies broadly. For example, NOV also acquired Consolidated Pressure for approximately $7 million. If a good strategic fit exists, acquirers both large and small are actively pursuing opportunities and ultimately closing transactions. While InterOcean does not expect the current environment of strong acquisition demand to diminish in the foreseeable future, owners contemplating a business sale are well advised to consider the robust nature of today’s Flow Control M&A market. InterOcean Advisors monitors the Flow Controls sector closely and is familiar with the firms, both strategic and financial, that are actively acquiring and/or seeking investments. As a result, we are well positioned to offer guidance on valuation, strategic ownership alternatives, and possible timing. For additional information about this article or our M&A advisory services for business owners please contact Bill Doepke at 312.698.6906 / wdoepke@ioadvisors.com or any member of the InterOcean Advisors LLC team.